Hello blog readers! Can you recommend to me your favorite books/movies/TV shows involving time travel? Particularly time travelers who travel purposely through means under their control: as in Doctor Who and Diana Wynne Jones’ A Tale of Time City, for example. Feel free to warn me away from any that really didn’t work for you as well. I have fond memories of the TV version of SLAUGHTERHOUSE-FIVE. I think that was PBS. I didn’t know there was a TV version! Will have to take a look. Thanks! I haven’t read it yet, but I bought My Dirty Little Book of Stolen Time off someone’s recommendation. Also, Myra McEntire’s Hourglass is being called ‘time slip’ but I LOVE that book. I”m also starting Ruby Red soon. 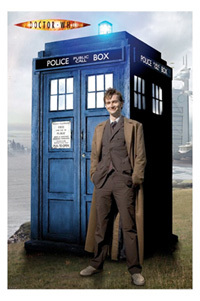 Doctor Who is one of my favourites. Been watching it since I was tiny! The Time Machine (1960); it’s a bit dated, so maybe I only like it so much because I grew up with it — either that, or because it stars Rod Taylor, heh. I wasn’t as fond of the (H.G. Wells) book, and I haven’t seen the remake. I think the third Harry Potter movie did time travel better than the book, but you’ve probably seen that already, too. Terry Gilliam’s Time Bandits is rather fun, and his Twelve Monkeys also involves time travel. And Star Trek IV, but that’s more about saving the whales and seeing the Star Trek gang being silly rather than time travel proper. I seem to remember the Bill and Ted movies featuring time travel . . .
There’s a chance Time After Time (Malcolm McDowell and David Warner) is awful, but I do remember liking it when I was younger. In most of the other examples I can think of (Quantum Leap, The Time Traveler’s Wife, Donnie Darko, The Girl Who Leapt Through Time, Tom’s Midnight Garden, Planet of the Apes, Peggy Sue Got Married, Terminator, Army of Darkness, Kate and Leopold, 13 Going on 30, &c.), the time travelling is either out of the characters’ control or not really central to the plot. Several of Madeleine L’Engle’s books sort of involve time travel (especially Many Waters and An Acceptable Time, from what I remember), but I don’t recall how the characters were able to travel through time. I think it was out of their control. I’ve heard really good things about To Say Nothing of the Dog, but I don’t know much about it. I recommend you The Time Traveler’s Wife by Audrey Niffenegger. You can see the movie after you read the book.